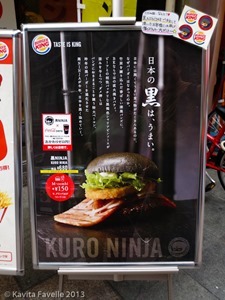 I love BK Whoppers so when I learned that the Kuro Ninja was being launched during our recent holiday in Japan, I really wanted to seek it out. On a day of eating that a hobbit would be proud of (during which we stopped for multiple breakfasts, multiple lunches and an enormous dinner), we finally tracked it down in Osaka. Most striking, of course, is the black bun, coloured with bamboo charcoal. It’s impressively black and with no discernible oddness of taste that we could detect. Inside is a whopper patty, a round hash brown and a ridiculously long slab of thick bacon that lolls lewdly out from two sides. The regular lettuce, onions and sauce are complemented by Chaliapin sauce – this onion and garlic sauce is named for Russian opera singer Fyodor Ivanovich Chaliapin; during a visit to Tokyo in 1936, a steak and sauce dish was created for him by a hotel chef and has been named in his honour ever since. 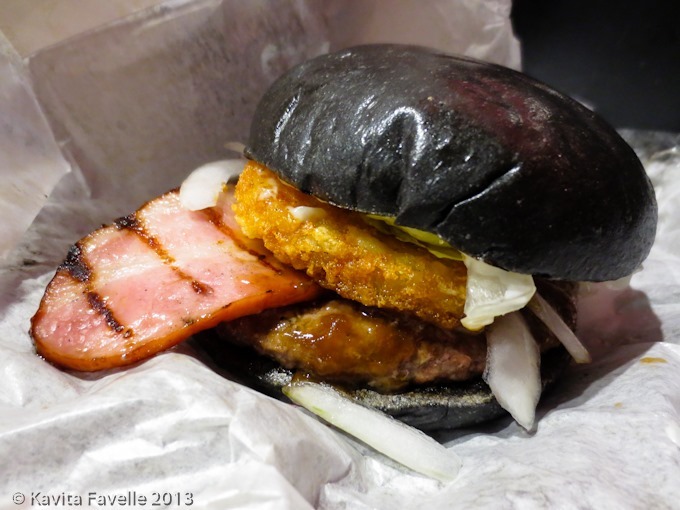 Apparently, various of these elements have been seen before in some of Burger King’s earlier limited edition specials – the black bun also featured in 2012’s Kuro Burger, essentially a regular whopper but served with black ketchup (flavoured and coloured with garlic and squid ink); the bacon “tongue” was at the heart of Big Bacon Whopper, just a month or two before Kuro Ninja was available; and the Chaliapin sauce was a key component of the XT Steakhouse, a 2011 creation. What did we think? We liked it! The balance of flavours and textures worked well enough. 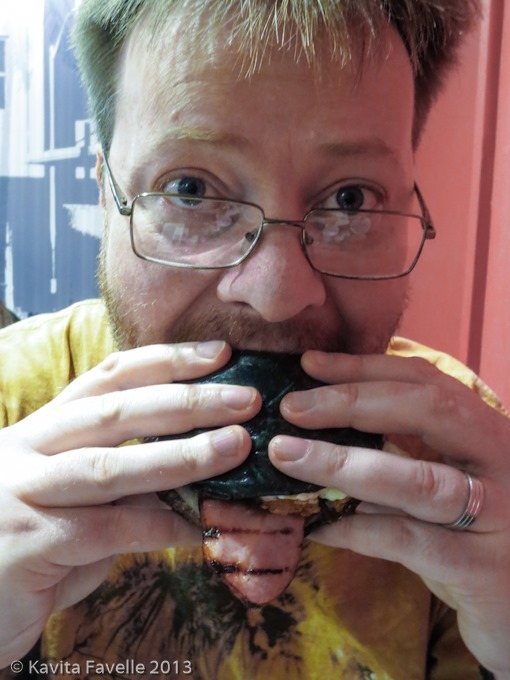 I found the hash brown made the burger a touch too big to eat easily; Pete had no such problem. The bacon tongue we folded inside, though that made the burger even bigger. Personally, I’d still choose a regular whopper over the Kuro Ninja… but I would really like to try the Kuro Whopper (no longer available) with its garlic and squid ink ketchup! Although the Kuro Ninja was advertised as ¥ 680 (burger only) / ¥ 830 (burger, fries and drink) the branch we went to in Osaka had increased the meal deal price to ¥ 1040 (about £7). 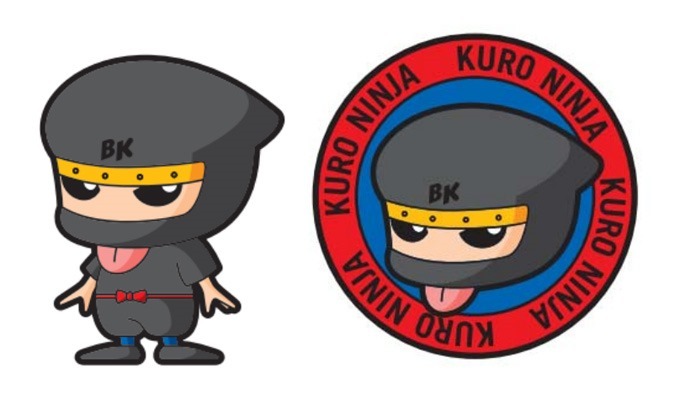 But hey, we did get cute Kuro Ninja stickers for that too! Read more of my Japan content, here. 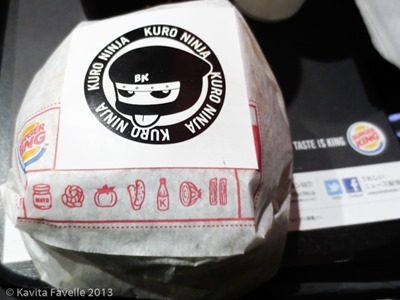 2 Comments to "Burger King Japan’s Kuro Ninja"
It was fun to read your blog. Living in Japan, I didn’t know Kuro Ninja. There is no Burger King around my house, which is a shame! This type of character is getting popular in Japan because they attracted people’s attention. In other words, they can be a great advertisement for the company. These characters are called “Yuru-kyara” in Japanese, literally means loose and relaxing. There is even a “Yuru-kyara Grand Prix” held every year. It’s amazing that you know a lot about Japan! I have only been to Japan twice (in autumn 2012 and autumn 2013) so I’m still learning, and there’s so much much much more to learn but I’m enjoying the experience so much.